Etruscan bronze, dark brown, solid cast. Mid-5th century BCE. Height 9 cm. Saint Petersburg, The State Hermitage MuseumInv. No. Б. 2042. Unknown; from the Levachov collection, acquired in 1928. 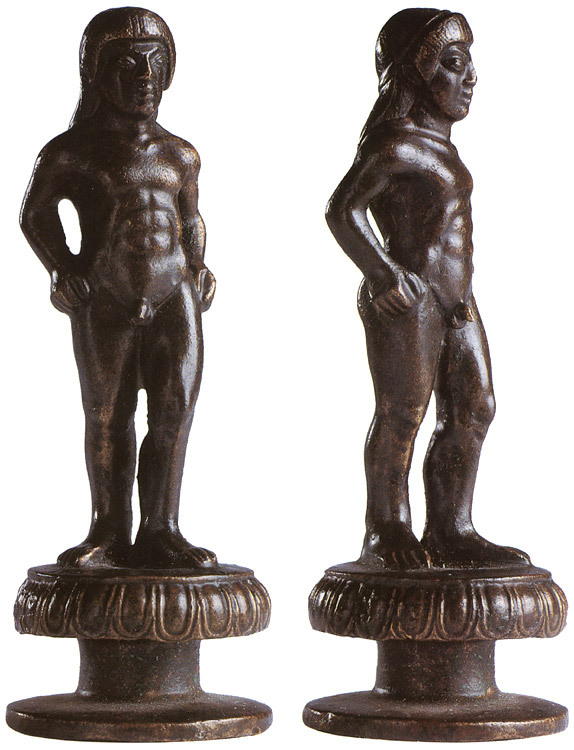 This statuette constituted the decorative element on top of a candelabrum. The athlete’s left leg is projected a little way forward. Both arms are bent slightly back and the hands rest on the hips. The hair, which ends in a roll on the forehead, frames the face and falls over the back behind. The mass of hair on the top of the head is held by a ribbon. The face is characterized by a thin smile and large eyes. The musculature is vigorously modelled. This work is a good example of the Vulci school. Bronzes antiques. Exhibition catalogue (Leningrad, 1973) no. 134 p. 56. © 1993. Photo, text: Olympism in antiquity. Olympic Museum Lausanne. Bertelsmann UFA. Industria Gráfica S. A. Barcelona, 1993, p. 80 cat. no. 23.